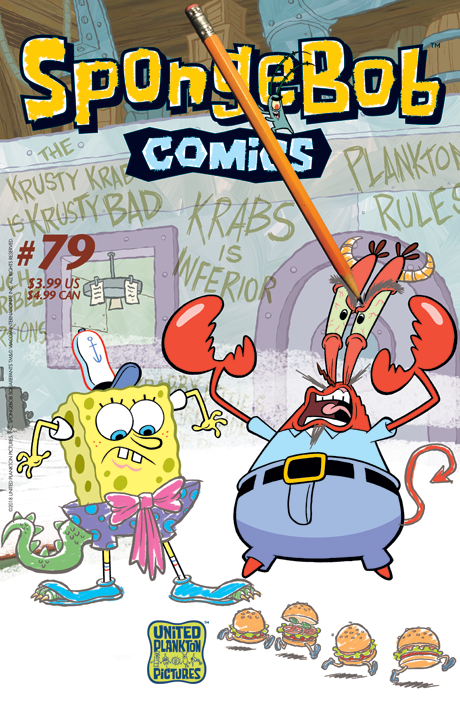 It’s all-out aquatic op-ed war as Plankton and Mr. Krabs engage in the extreme sport of editorial cartooning in the newspapers of Bikini Bottom! Their slanderous scribblings even draw SpongeBob and Squidward into the destructive conflict—threatening everything they hold dear! Find out who gets the last laugh in “The Cross-Hatch of Despair!” Also: the threat of whirlpools forces Mr. Krabs to activate “The Buddy System,” which means Squidward and SponegBob must stay close together all day! And in “Facial Hair Scare,” a fake beard mishap throws Patrick into an identity crisis! All this plus “Ocean Facts” by Maris Wicks and “SpongeFunnies” by James Kochalka!